I was very interested to read the latest U.K. media on hot chips and takeaways. Advice has been given to U.K. fast food outlets, encouraging smaller portions, with reduced calories, in order to drastically reduce obesity levels. It’s the first step towards stricter requirements for traders. People can still enjoy their favourite takeaway – but just less of it. It is expected that the U.K. government will eventually cap calories on takeaways. Limits on ready meals, crisps, chips, biscuits, sandwiches, cooking sauces, soups, burgers and processed meats, among other food products, are to be revealed in Spring. New Zealand has a similar battle on it’s hands with high obesity rates in adults and children and a growing fast-food industry. The challenge lies in educating both the consumer and the food service provider. CHIP GROUP NZ are paving the way, with support from the Ministry of Health, in our CHIP GROUP BEST FRYING PRACTICE training. At a recent seminar in Auckland, which Chip Group presented at, leading up to the Lantern Festival for Chinese New Year celebrations, the idea of new recommendations from local councils, for food quality, was raised. Jacqui Yip, from the Auckland Regional Public Health Service, arranged the seminar and she has been working closely with Auckland Council and ATEED events teams for the past 3 years to establish some clear guidelines on healthier food and drink. They are working towards making these guideline mandatory (some South Auckland local boards have already passed resolutions to adopt them) in the not too distant future, which will mean if food vendors don’t comply with guidelines, they may not have their applications to attend events approved. The move towards healthier food service offerings, is also being encouraged with incentive prizes, awarded by judges at events. 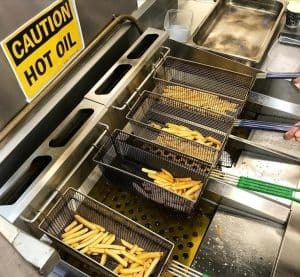 Chip Group mirrors this incentive scheme by having it’s industry awards each year, which require traders to have undertaken our Best Fry Practice training. It is important for Chip Group to work alongside our suppliers and processors, who have a strong relationship with traders, to improve the health of takeaways … hot chips being one of the most popular takeaway in NZ.We love our chips and we care about the health impact as well.